Waiting on Wednesday is a weekly meme hosted by Jill at Breaking The Spine. It showcases everyone's most anticipated books. 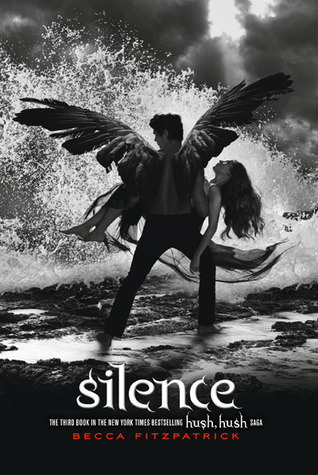 This week, my pick is Silence, the third book to Becca Fitzpatrick's Hush, Hush series. Summary: "The noise between Patch and Nora is gone. They've overcome the secrets riddled in Patch's dark past...bridged two irreconcilable worlds...faced heart-wrenching tests of betrayal, loyalty and trust...and all for a love that will transcend the boundary between heaven and earth. Armed with nothing but their absolute faith in one another, Patch and Nora enter a desperate fight...The noise between Patch and Nora is gone. They've overcome the secrets riddled in Patch's dark past...bridged two irreconcilable worlds...faced heart-wrenching tests of betrayal, loyalty and trust...and all for a love that will transcend the boundary between heaven and earth. Armed with nothing but their absolute faith in one another, Patch and Nora enter a desperate fight to stop a villain who holds the power to shatter everything they've worked for—and their love—forever." Why I Can't Wait:First off, love the cover. It's gorgeous, and I think my favorite one thus far! Now, onto the book. I absolutely love this series. And especially with the way Crescendo ends, I'm dying to know what happens next. I have to know what happens next between Nora and Patch. Will they be okay? Are they together? Are they alive? WHAT THE FRENCH, TOAST?! EEEEPPPP!!!! lol to what the French Toast. It looks like a good series. Can't wait to read this one !! I loved the first two books .. and just like you, I was like "What the F**K?" when I finsihed Crescendo :D ! You were just eagerly waiting for the cover reveal so you could post this xD. I don't know if I'll read this one. I'm still mad about Crescendo. LOL @ Cari. Crescendo made me mad, too, but I still want to read this one..badly! Great pick!! Paranormal Romance is so not my thing. But I have to admit that this cover is amazing. Ohh, I love the cover! I can't wait to read this even though I still have to read Crescendo!